PARIS --- The Belgian government promised NATO as far back as 2013 that it would buy the Lockheed F-35 to replace its ageing F-16 fighters, and subsequently organized a tender to give the misleading appearance of an open and free competition for the €3.4 billion purchase. These, and other allegations about how Belgium manipulated its ongoing fighter competition, were published Oct. 8 by Knack, a leading Belgian newsmagazine. These allegations are taken seriously as Knack is published in Flanders, the country’s Dutch-speaking region, and normally supports the current Belgian government which is supported by the Flemish National Alliance, N-VA. The timing of the article is also doubly awkward for the Belgian government. Local elections will take place on Sunday, Oct. 14, and these revelations will not help the government coalition. Claims that the fighter competition is a sham will also make it difficult for Belgian Prime Minister Charles Michel to tell French President Emmanuel Macron that he could not evaluate France’s offer of Dassault Rafale fighters because France did not follow the competition’s procedures. Macron is due to make a state visit to Belgium in mid-November. 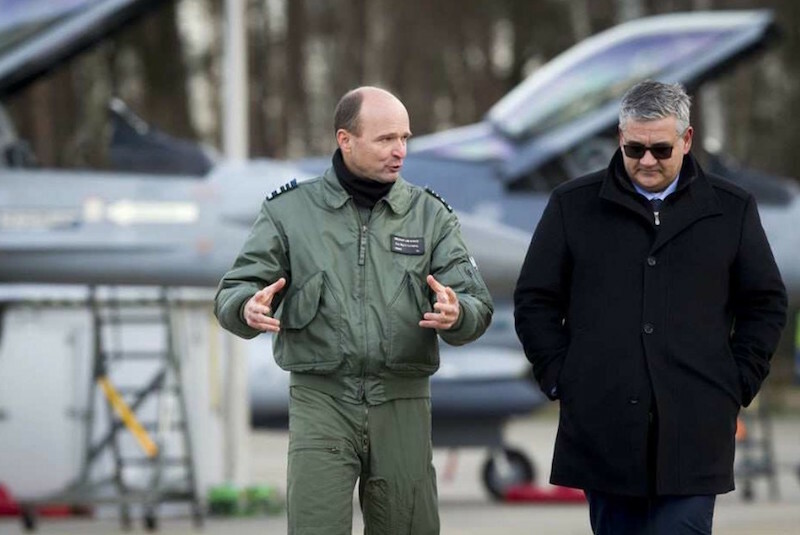 Belgian politicians and senior military including former defense minister Pieter de Crem, are accused of having asked NATO to add ten “stealth fighters” to Belgium’s Capability Target. The government in office at the time accepted this new tasking, and then used it to rationalize the procurement of the only “stealth” fighter available on the market, the Lockheed F-35. A spokesman for de Crem declined comment, and referred all queries to defense minister Steven Vandeput, which is making no comment. Basing its allegations on internal Belgian Air Force and defense ministry memos, Knack further claims that the competition, which was ostensibly launched to transparently select a new fighter, was a sham, and in fact tailor-made to favor the F-35 by focusing on its strong points and avoiding its known weaknesses. For example, the government’s Request for Government Proposals (RfGP) issued in March 2017 does not mention the Air Policing mission, for which the Belgian Air Force regularly deploys to protect the airspace of other NATO allies, but for which the F-35 is ill-suited because of its high fuel consumption, comparatively low speed and limited range. But the RfGP did introduce the new NATO requirement that ten of the new fighters be specialized for offensive Suppression of Enemy Air Defenses (SEAD) missions, which the Belgian Air Force has never before been assigned, and which it is not equipped nor trained for, but which favor the “stealth” features of the F-35. Asked by Knack who had approved the requirements set out in the RfGP, Laurence Mortier, a spokeswoman for Belgian Defense Minister Steven Vandeput, said “they were imposed by NATO,” without elaborating, adding “I repeat: the criteria were imposed by NATO” when questioned further. Ms. Mortier did not respond to an e-mail request for comment. Knack says the Belgian Air Force’s hidden preference for the F-35 is demonstrated by several e-mail exchanges between top commanders that it obtained. In one of these messages, Lt. Col. Steven Lauwereys, now chief of the new fighter acquisition staff, tells Major General Frederik Vansina, now the air force chief of staff, that he had avoided mentioning a “stealth” requirement in an early briefing for prospective bidders. The Belgian government is also accused by Knack of having manipulated the cost and pricing information it provides to Parliament and to the public. This accusation is not new, and is explained by implausible statements by Vandeput claiming that the €3.4 billion budgeted is sufficient to procure 34 new fighters. In fact, the United States Defense Security Cooperation Agency (DSCA) earlier this year notified Congress of a Belgian request to buy 34 Lockheed F-35As, which it said would cost $6.53 billion, or €5.13 billion (€150.9 million each) when all the required equipment is included. This is about 50% higher than the amount budgeted by Belgium. Furthermore, some observers point out that Belgium’s northern neighbor, The Netherlands, are buying 37 F-35As at an estimated cost of €4.5 billion (or €121.6 million each), substantially more than Belgium’s €3.4 billion budget (€100 million each).